UPTON NY – A team of scientists has discovered a single-site, visible-light-activated catalyst that converts carbon dioxide (CO2) into “building block” molecules that could be used for creating useful chemicals. The discovery opens the possibility of using sunlight to turn a greenhouse gas into hydrocarbon fuels. The scientists used the National Synchrotron Light Source II, a U.S. Department of Energy (DOE) Office of Science user facility at Brookhaven National Laboratory, to uncover details of the efficient reaction, which used a single ion of cobalt to help lower the energy barrier for breaking down CO2. The team describes this single-site catalyst in a paper just published in the Journal of the American Chemical Society. Converting CO2 into simpler parts–carbon monoxide (CO) and oxygen–has valuable real-world applications. “By breaking CO2, we can kill two birds with one stone–remove CO2 from the atmosphere and make building blocks for making fuel,” said Anatoly Frenkel, a chemist with a joint appointment at Brookhaven Lab and Stony Brook University. Frenkel led the effort to understand the activity of the catalyst, which was made by Gonghu Li, a physical chemist at the University of New Hampshire. “We now have evidence that we have made a single-site catalyst. No previous work has reported solar CO2 reduction using a single ion,” said Frenkel. Breaking the bonds that hold CO2 together takes a lot of energy and a long time. So, Li set out to develop a catalyst to lower the energy barrier and speed up the process. “The question is, between several possible catalysts, which are efficient and practical to implement in industry?” said Frenkel. One key ingredient required to break the bonds of CO2 is a supply of electrons. These electrons can be generated when a material known as a semiconductor gets activated by energy in the form of light. The light “kicks” electrons out, so to speak, making them available to the catalyst for chemical reactions. Sunlight could be a natural source of such light. But many semiconductors can only be activated by ultraviolet light, which makes up less than a five percent of the solar spectrum. “The challenge is to find another semiconductor material where the energy of natural sunlight will make a perfect match to kick out the electrons,” Frenkel said. The scientists also needed the semiconductor to be bound to a catalyst made from materials that could be found abundantly in nature, rather than rare, expensive metals such as platinum. And they wanted the catalyst to be selective enough to drive only the reaction that converts CO2 to CO.
“We don’t want the electrons to be used for reactions other than reducing CO2,” Frenkel said. Cobalt ions bound to graphitic carbon nitride (C3N4), a semiconductor made of carbon, nitrogen, and hydrogen atoms, ticked all the boxes for these requirements. “There has been significant interest in using C3N4 as a metal-free semiconductor to harvest visible light and drive chemical reactions,” said Li. “Electrons generated by C3N4 under light irradiation have energy high enough to reduce CO2. Such electrons often don’t have lifetimes long enough to allow them to travel to the semiconductor surface for use in chemical reactions. In our study, we adopted a common and effective strategy to build up enough energetic electrons for the catalyst by using a sacrificial electron donor. This strategy allowed us to focus on the catalysis for CO2 reduction. Ultimately, we want to use water molecules as the electron donor for our catalysis,” he added. Peipei Huang, a postdoctoral researcher in Li’s lab, made the catalyst by simply depositing cobalt ions on a C3N4 material made from commercially available urea. The team then extensively examined the synthesized catalyst using a variety of techniques in collaboration with Christine Caputo at the University of New Hampshire and Ronald Grimm at Worcester Polytechnic Institute. The catalyst worked in CO2 reduction under visible-light irradiation. So Frenkel and Li brainstormed experiments that would show the structure of the catalyst with precision. Structural studies would give the scientists information about the number of cobalt atoms, their location relative to the carbon and nitrogen atoms, and other characteristics the scientists could potentially adjust to try to improve the catalyst further. 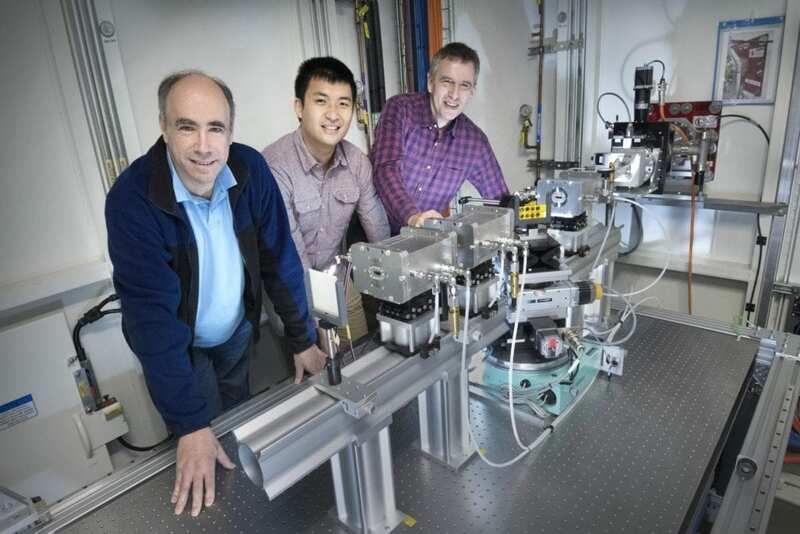 They turned to the Quick x-ray Absorption and Scattering (QAS) beamline at NSLS-II to use x-ray absorption spectroscopy. With help from lead beamline scientist Steven Ehrlich, Frenkel’s student Jiahao Huang took the data and analyzed the spectra. In this technique, the x-rays from NSLS-II get absorbed by atoms in the sample, which then eject waves of electrons. The spectra show how these electron waves interact with surrounding atoms, similar to the way ripples on the surface of a lake get disrupted when they encounter rocks. The analysis showed that the catalyst breaking down CO2 was made of single ions of cobalt surrounded on all sides by nitrogen atoms. “There were no cobalt-cobalt pairs. So, this was evidence that they were in fact single atoms of cobalt dispersed on the surface,” Frenkel said. “This data also narrows down the possible structural arrangements, which provides information for theorists to fully evaluate and understand the reactions,” Frenkel added. Though the science outlined in the paper is not yet in practical use, there are abundant possibilities for applications, Frenkel said. In the future, such single-site catalysts could be used in large-scale areas with abundant sunlight to break down excess CO2 in the atmosphere, similar to the way plants break down CO2 and reuse its building blocks to build sugars in the process of photosynthesis. But instead of making sugars, scientists might use the CO building blocks to generate synthetic fuels or other useful chemicals. This research was supported by the DOE Office of Science and partly by the National Science Foundation. One of ten national laboratories overseen and primarily funded by the Office of Science of the U.S. Department of Energy (DOE), Brookhaven National Laboratory conducts research in the physical, biomedical, and environmental sciences, as well as in energy technologies and national security. Brookhaven Lab also builds and operates major scientific facilities available to university, industry and government researchers. Brookhaven is operated and managed for DOE’s Office of Science by Brookhaven Science Associates, a limited-liability company founded by the Research Foundation for the State University of New York on behalf of Stony Brook University, the largest academic user of Laboratory facilities, and Battelle, a nonprofit applied science and technology organization.